The Schaffen is a customisable watch. This isn’t the first time we’ve seen the idea of a customisable watch, but it is, perhaps, the very best time we’ve had with a customisable watch. When you buy one, you can choose from a predetermined set of hands, case, and dials to come up with a watch you can love. Uniquely, the rotor can be custom-cut using a pattern of your own design. The movement is a Swiss SW-200. But can the bits add up to more than the sum of their parts? Can it really work out, or will it just be a mishmash of bits? The case of the S65 I have on my wrist right now is made of stainless steel. The side case profile follows such historic examples as the Audemars Piguet Royal Oak or the Girard Perregaux Laureato. The bracelet also looks like Laureato’s, and is beautifully executed with brushed surfaces and polished bevels at the sides and the sides of the center links. The bezel is a two-step piece with brushed top ring, polished ring below that with the octagonal outer edge. The clasp also has a polished beveled edge that follows the profile of the bracelet. The dial here is a beautiful horizontally-ridged texture with raised markers, raised 12 numeral, and a black datewheel that fades nicely into the dial. The hand length is perfect, and glows nicely. The movement running the show is held behind a display back, and, while not decorated, is fun to look at with its custom-cut rotor. It’s an Elabore grade SW200, and the company provides a 2 year warranty on the watch. Honestly, it’s hard to beat. It’s a beautifully made, Swiss-powered, custom rotor, excellent dial, with lots of attention to the surfaces. 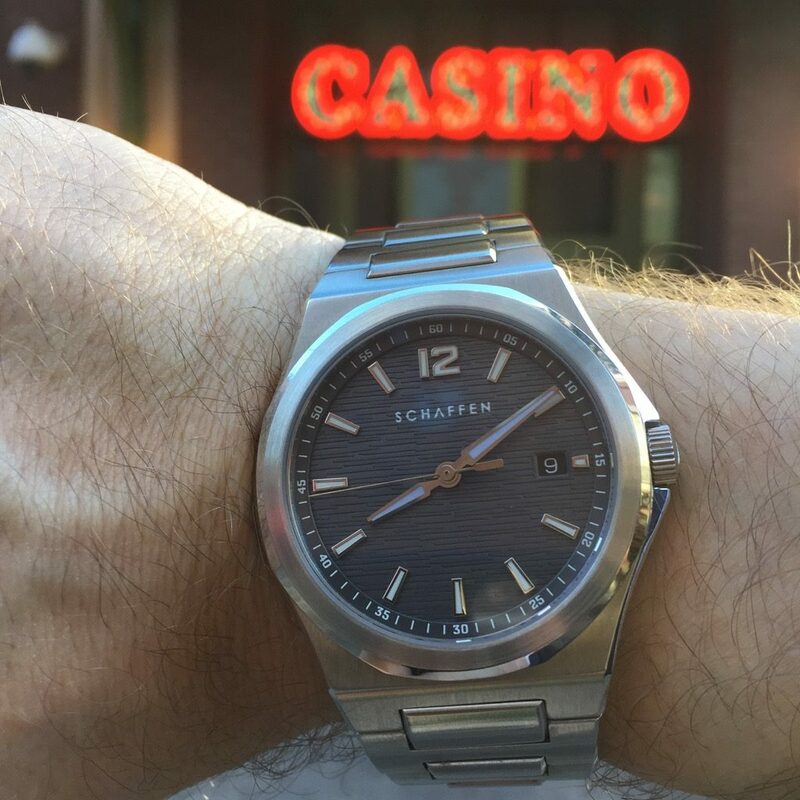 If you wanted an AP or a Girard Perregaux and didn’t want to pay Laureato money, it’s very difficult for me to come up with any other answer: this is your watch. Pricing starts at $499 for early-bird orders on Kickstarter. Who we think it might be for: You’re an AP man. You want a Girard Perregaux Laureato. You love this kind of Genta design, and it’s time to have one in your life. Would I buy one for myself based on what I’ve seen? : You’re goddamned right I would. If I could make one design suggestion, it would be: Strap adjustment on the prototype I am wearing uses solid pins to adjust the bracelet. I would recommend a change to split pins or screw pins for ease of adjustment. I would also advise a butterfly clasp rather than the fold-over clasp. But these are very minor requests of mine. SCHAFFEN will adjust the bracelet to your wrist size if you tell them your wrist size at time of order. What spoke to me the most about this watch: The beauty of the case, dial, bracelet and custom rotor. It speaks to me.